Kentuckians enjoy a variety of music, from classical, rock and jazz to country, folk, gospel and bluegrass. So visitors should expect to find a concert or performance somewhere to suit their personal tastes. A Kentucky instrument often found at festivals involving traditional or mountain crafts is the dulcimer. This is a stringed instrument found in the Appalachian area and used to accompany folk songs passed down from generation to generation. Regional dishes which you will find in Kentucky include Kentucky ham, Southern fried chicken, corn pudding, spoon bread, derby pie and burgoo. Burgoo is a thick soup made with several types of meat and vegetables, and cooked slowly all day. You can usually taste the delicious flavor of tender beef, and it is quite warming on a fall day. Spoon bread is just what its name suggestions - a soft bread (with a bit of a corn meal flavor) which can be eaten with a spoon. Try traditional restaurants such as Boone Tavern, where Berea College students serve meals, to enjoy this regional treat. And if you love chocolate, you will love Derby Pie! A number of nationally known musicians have a connection to Kentucky. In the rock field there is the Back Street Boys, who easily fill concert arenas. The Everly Brothers of Western Kentucky were stars in the rock'n'roll field in the 1960s but would probably fit comfortably into today's country music scene. In country music, a few of the well-known Kentuckians are Billy Ray Cyrus, Crystal Gale, The Judds, Patty Loveless, Loretta Lynn, Michael Montgomery, Ricky Skaggs, Steve Wariner, and Dwight Yoakam. Highway 23 in Kentucky has been renamed "The Country Music Highway" because so many entertainers were born close by. No page about Kentucky would be complete without a few words about horses. The green fields, horse barns and board fences are among the first sights you will see on entering the Bluegrass. For pleasure riding, several commercial stables are available and some state parks feature horseback riding. The Kentucky Horse Park is the site of the annual Rolex Three-Day event, a colorful sight which has even attracted a member or two of the British Royal family. Beautiful equine art can be found in local galleries in Lexington and Louisville. Thoroughbred Park in downtown Lexington features life size statues of horses in motion. 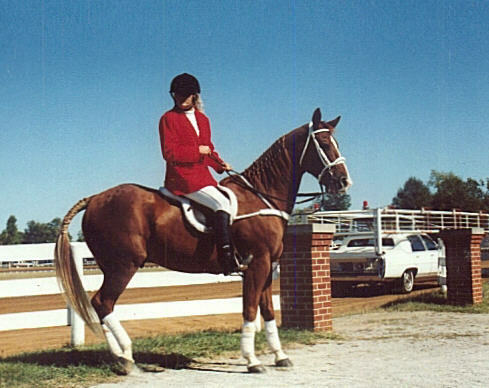 The picture you see below was taken of a lively horse and rider at the Red Mile Grand Circuit in Lexington. Kentuckians are sports fans. Many of us support our local colleges, universities, and high schools in their efforts. Just about anyone can tell you how the University of Kentucky Wildcats are doing this season in basketball or football. Lexington has been enjoying the new sport of ice hockey with the Thoroughblades team, and will soon have a professional baseball team.